GENERAL: We met the enemy, about 6,000 strong, commanded by Brigadier-General Gregg, at a point 2½ miles west of this place, where they were posted and fully prepared to receive us. 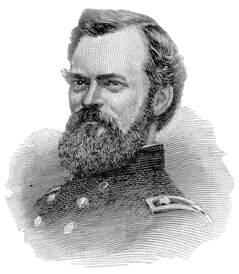 After a sharp and severe contest of about three hours' duration, in which Major-General Logan's division was chiefly engaged, the enemy were driven back and retreated precipitately, passing out of this town on the Jackson road, Edwards Depot road, and Gallatin road. The rough and impracticable nature of the country, filled with ravines and dense undergrowth, prevented anything like an effective use of artillery or a very rapid pursuit. Our loss has been pretty severe in General John E. Smith's and General Dennis' brigades, though I think 250 will cover the total killed, wounded, and missing. The loss of the enemy is fully as heavy, if not more so than ours. There are over 80 of their wounded in town, besides the number left on the battle-field and picked up by our men. We disabled two of the enemy's guns, one by bursting, which fell into our possession, and captured about 100 prisoners. We have to mourn the loss of Colonel Richards, of the Twentieth Illinois, who was killed while gallantly encouraging his men. Col. Ed. S. McCook, Thirty-first Illinois, was wounded in the foot. These, as far as I know, are the only casualties of the field officers. As soon as the returns are in, I will give you full particulars. Two rebel colonels are known to have been killed.